Lieutenant M'Ress (Voice by Majel Barrett). Starfleet officer assigned to the engineering section of the U.S.S. Enterprise while under the command of Captain James Kirk. M'Ress sometimes stood watch on the bridge as relief Communications Officer. M'Ress was a felinoid, with long, thick orange-tan fur and golden yellow eyes. M'Ress spoke very softly and had a cat-like purring quality to her voice, which became especially evident when she was excited. Because she had thick pads on the soles of her feet she required no footwear. M'Ress came aboard the Enterprise in 2269 along with Lieutenant Arex. On stardate 4978.5 When Harry Mudd's love potion accidentally was released into the ship's air supply, Mr. Scott and Lieutenant M'Ress found each other quite attractive, but after the effects of the drug wore off, they became disagreeable with each other. ("Mudd's Passion"). 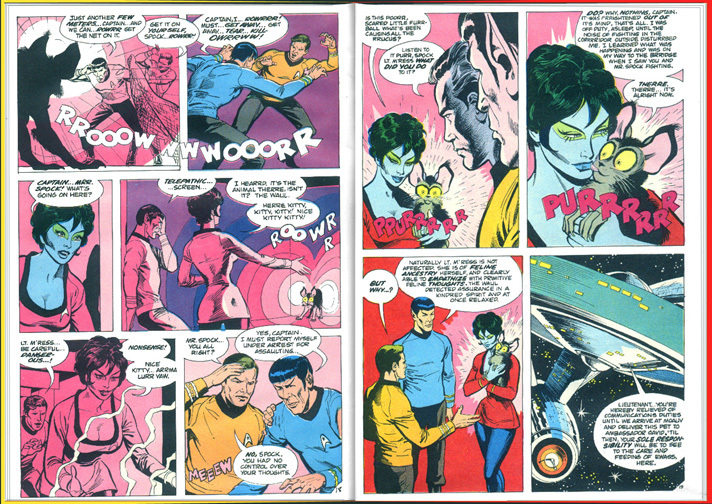 M'Ress most recently appeared, along with Arex, in STAR TREK: Gateways Book#6 New Frontier "Cold Wars" by Peter David, published in October 2001 and in STAR TREK: New Frontier #12 "Being Human" published in November 2001. A three-page biography of M'Ress was available from the Lincoln Enterprises 1974 catalog. This author considers this material semi-canon and it is included in this web site since virtually nothing of M'Ress's past was revealed in the Animated episodes. 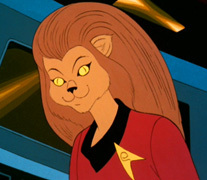 The voice of the cat-like M'Ress was provided by Majel Barrett. She also voiced the main computer in the original series, the animated series, STAR TREK: The Next Generation, STAR TREK: Deep Space Nine and STAR TREK: Voyager.